Glebe was Sydney's first rugby league club and it contributed much to the code's early development, producing some outstanding players such as try-scoring loose forward Frank Burge and half-back and Kangaroo captain Chris McKivat. Glebe's first grade finished second in the competition of four occasions (1911, 1912, 1915 and 1922), However, its second grade won five premierships and its third grade one. The club was an integral part of community life of this working-class suburb where life was a struggle. Glebe's passionate supporters streamed down the hill to the club's home ground at Wentworth Park to support the men in Red, often departing from the Burton Family Hotel, the club's unofficial headquarters. The unceremonious dumping of Glebe in 1929, after just 22 seasons, generated an angry reaction from club supporters. 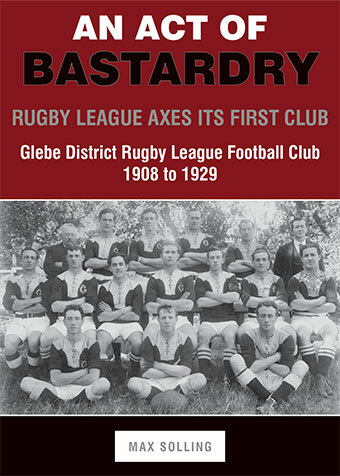 Even though 85 years have elapsed since then, it is important to unravel the details of the grubby plot to exorcise Glebe from the rugby league competition, to identify the main instigators and to explore the flimsy grounds used to justify Glebe's expulsion. It is also important to belatedly recognise the contributions to rugby league of Glebe's players, supporters and sponsors. Since he settled in Glebe in 1960, Max Solling has involved himself in Glebe community life. He has written a number of histories of Glebe sporting clubs (rowing and hockey). His history of Glebe, Grandeur and Grit, was short-listed for the Premier's Literary Awards in 2008. A solicitor and a former law lecturer, Solling was Australian Universities Light-Welterweight Boxing Champion in 1961 and 1962.